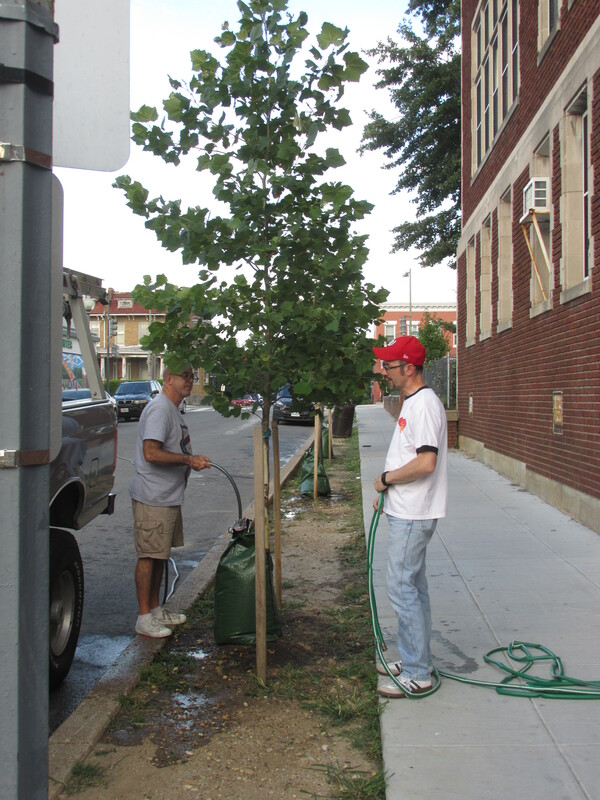 Volunteers Needed to Help Water Trees on Otis Place | Park View, D.C.
With the excessive heat we’ve been experiencing the past few days, our efforts to tree up the neighborhood are going to need some help. The eight new trees that were planted on Otis Place between the school and the recreation center are one place in particular that needs our help. Last night I was able to enlist the help of fellow ANC 1A Commissioner Richard DuBeshter to fill the water bags on each of the trees and it really didn’t take that long … but the bag need to be filled about once a week. What we need is a watering plan for the remainder of the summer and for next year. I can take care of the supplies and access to water, but we need some volunteers to take turns filling the bags. If you are able to help keep these trees alive, please contact me via email at 1a08 (at) anc.gov.com. This entry was posted on July 27, 2016 at 7:01 am and is filed under Streets and Trees. You can subscribe via RSS 2.0 feed to this post's comments.